Are you a homebrewer interested in expanding your fermentation hobby? Well, why not jump into winemaking! Our wine kits are an excellent way to make high quality wine at home, without requiring all of the large equipment that wineries use. We have dozens of wine kits to choose from, so no matter what your favorite type of wine, we're certain to have a kit you'll like! 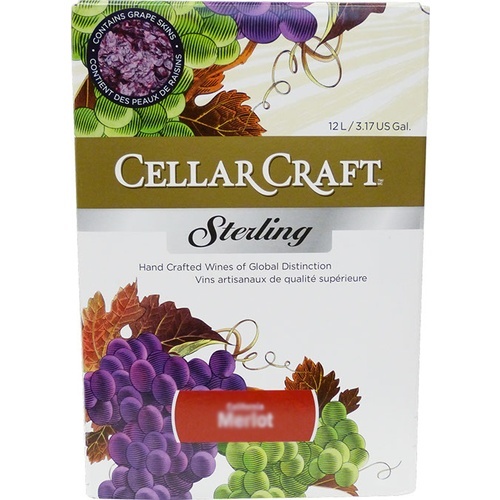 This California Cabernet wine kit, fermented on a 1.5 liter virgin crushed California Cabernet Sauvignon grape pack, delivers a characteristically firm-tannin wine with loads of black fruit character made more interesting by the vanilla notes from the oak. The aromatics suggest blackberry and black currant. Flavor is centered around red and black currants which remain evident through the nice finish. Six months of ageing should reveal a harmonized wine with somewhat softened tannins, but the wine will improve for a year or two. This is a wine to serve with beef and lamb. Made this cab before. Giving as a gift. What type of yeast is recommended with this kit/included, and is there any oak included? BEST ANSWER: I have used BDX or Bordeaux red, BM45, BX 4x4 and MT, all with good result. My favorite was the BM45 for its overall depth of flavor. This kit also blends well with Syrah and merlot. there are oak chips included for use during fermentation. I usually add some oak staves during clearing and age up to two months before bottling. Good luck and enjoy. I purchased the MT Dry Wine Yeast per another suggestion. DYW83. I think the kit comes with an oak powder but I didnt use that. I purchased 1oz of toasted French Oak cubes and added them into the secondary. Wine is still in the fermentor and wont be tasting until next year. Lalvin ec1118 yeast and yes it comes with 2 packages of French medium toasted oak! Well i'm not really a wine drinker, but I decided to give this a go because I do prefer red wine over any others (except mead). It has been in the bottle now for about 3 months and is already starting to smooth out and has a great taste and aroma. Since I am not really a red wine guy it's hard to compare, but I can say that I have had worse from store bought wine. It's pretty tasty, and easy to make. Tip: don't try to squeeze the grape pack into a carboy, it gets messy. Use a large mouth fermentor or a bucket for primary fermentation. I did not use the supplied yeast pack, but took the advice of the employee at the store and used RBS 133 which he said helps smooth out red wines. It definitely did, and pretty much matched it's profile, giving the wine a nice fruity aroma and flavor, and reduced the acidity. I wanted the wine a little more rich so I added less water and went for a 5 gallon batch instead of 6, per the instructions. I think i'll try the pinot noir next. I have made three batches of wine from this kit. The first with the supplied yeast. It took six months before it was drinkable but disappeared quickly after that. The second was made using the BDX strain with similar results but much better after six months in the bottle. The last batch was made using the MT strain of yeast. Much better nose and substantially better overall, again after some time in the bottle. This kit responds better with yeasts more suited to cabernet. Malolactic fermentation should be considered if you want to win any competitions but is still very good if aged for at least five to six months. I have also blended the two batches from two yeast strains with good results but additional ageing is required to allow all the flavors to develop.